The 3 in 1 Pill Masher is a great functionality in a small package. 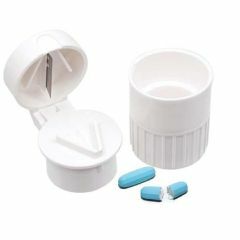 This handy tool features an easy-to-use pill cutting blade that swings down to precisely cut pills for ½ pill doses. Built-in V-shaped grooved wall holds pills firmly in place during cutting. The pill masher is operated by simply placing the pill in the bottom of the cup and twisting the unit. 3 compartments allow for storage of pills. 2-1/2" Long x 1-5/8" Diameter. Durable white plastic with stainless steel blade. Helpful tool for the visually impaired and those with arthritis and other challenges affecting the fingers and hands. This pill cutter does not cut well. When I attempted to cut a pill in half, it splintered into crumbs. I stopped after the third crumbled pill. does the crusher have teeth inside?